With the wind howling at her back and rain lashing at her eyes, Erle (pronounced Airlie), one of the best German wirehaired pointers (GWPs) in the country, has been running for 20 minutes. Her concentration never wavers as she grinds to a sudden, immovable halt. Quivering with anticipation from her single, raised paw to the tip of her rigid tail, she remains utterly still. Blinking the weather away, her focus never leaves her prey. Here she remains, waiting patiently for as long as she must, sometimes up to 15 minutes. The world stands still. A sudden beating of wings from the falcon tells her that it’s nearly time. The whistle sounds and she creeps purposefully forwards. The prey is flushed, and in a heartbeat, there’s a deadly, 200mph descent from 3,000ft in the air-the falcon stoops, its claws locked in a fatal clasp. Handler, dog and bird have worked seamlessly as a single entity. 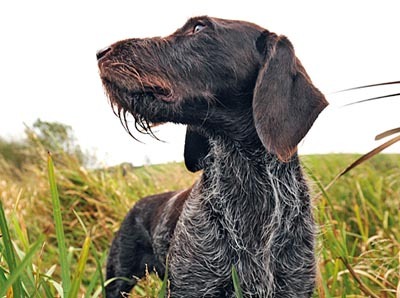 ‘She’s exceptionally versatile, fast yet incredibly accurate, and can work easily in both deep thicket and open country,’ explains Diana Durman Walters, president of the German Wirehaired Pointer Club. Diana has owned and bred falconry dogs, at the Wiggmansburg Kennels, in Carmarthen, South Wales, since 1978, but Erle (Erle vom Alten Berg) is ‘a perfect example of the breed. I imported her from Bavaria when she was two, and she’s produced some super litters. Diana has been in falconry for more than 40 years. She owned and bred the first GWP to become an Open field-trial champion, but still counts herself lucky to have found Erle. ‘She’s truly exceptional-the dog of a lifetime’. Telephone Diana on 01267 229159, or visit www.wiggmansburg.co.uk.